Graduation is over and summer is upon us. My Uncle Roy has moved out of his house and now lives in a house a bit farther down the road. In the front of the house is Duby’s store and he lives in the rooms in the back. The shelves are open and Joe and Eva, the proprietors, carry a few basic canned goods. There are two coolers which hold soft drinks and the other a variety of beers. Eva has asked if I would like to mind the store when she has to go to Norway to pick up supplies. Ma is not crazy about the idea,but says I can do it until another job comes along so I can earn money for school clothes. After all, Rex and I will be attending high school in September and I’d like some nice clothes to wear. This Sunday Dad is planning another car trip and I’d like to go along just to get out of the house, but Eva says she needs me at the store. I know that Dad plans to hunt up some old cemeteries. One of his most favorite things in the world is to walk through and find old stones. Sometimes he jots down the sayings on the stones. He really likes the stones which might have a history behind it. I don’t know how many times he has been to the grave of Metallak and that evening will talk about it and have a display of stones he might have dug up along side the road somewhere. Ma says she never knows when he is going to throw the brakes on and come to a screeching halt. This evening is no different. I tended the store all day and had a few of the summer people come in for bread, milk and odds and ends. Only one man was pretty disgusted because he wanted beer and I told him I was too young to sell beer and he would have to come back the next day. That is the part of tending store I don’t like. Ma says she has a message for me from Winnie Hanscom. Seems Winnie has always worked for a school teacher from Forest Hills, NY, who summers on the Indian Pond road off Rowe Hill. Winnie has other plans and wonders if I would like the chance to work for her. The day would run from 9-4 and I’d be paid $10 a week. Well, if I want to, I can ride with Ma to Stowell’s Mill, where she works, in the morning and walk up to Winnie’s and rest and visit until it’s time to go down and meet this lady. Her name is Ethel E. Hobbs. Sounds interesting. Ma tells me on the way to work this Monday morning that when she was growing up, Miss Hobbs ran a summer camp for girls at this residence where she now summers. It was called Camp Sebowisha and girls came from everywhere to swim, boat and canoe on Indian Pond. They slept in two separate buildings on the hillside. Well this should be interesting, indeed. I’ve visited with Winnie, who filled me in on what some of my duties will be on this job. I am almost to the front door of this huge house and beginning to get a few butterflies. I rap on the door and step back a bit. The door opens and there stands a woman, whose gray hair is twirled up into some sort of “do” like fingers reaching for the sky. One eye looks at me and the other doesn’t quite make it to me. In the corner of her mouth, hangs a cigarette with an ash, threatening to topple at any moment. A little dog stands by her legs, not barking, just standing there. You must be Sandra, she says and with my nod, she went on , I am Ethel Hobbs. Come in, come in. The kitchen is huge, the two living rooms are vast and I wonder what I have gotten myself into,but this could be interesting. She points to a kettle that is shaped like a cauldron and has me put it on this gigantic wood stove. With buckets I fill it, and she tosses a box of 40 Mule Team Borax into the water, and behind that her “unmentionables” and tells me that in time the water will boil and I am to go occasionally and stir them with the big paddle sitting there. Meanwhile, I am given a bucket , a nail and a rag and told to follow her. I fill the bucket with hot water and something really smelly which I think is some sort of disinfectant. She tells me the stairs need a good cleaning and to put the rag over the nail and clean each corner of the stairway. She leaves me alone, which I like, and I am cleaning and dunking the cloth every few minutes. As I near the top of the stairs, the unmistakable smell of moth balls hits my nose. I hate moth balls. But I will get ten dollars on Friday if I can do the job right. I remember I haven’t stirred her “unmentionables” for awhile so race back down the stairs and give them a couple of turns. Miss Hobbs is in the gigantic “rec room” which still holds signs of the girls’ camp. They must have had such a good time there and I can imagine their sitting and having sing alongs in the evenings. Miss Hobbs announces it is lunch time and my stomach growls as I realize it is almost 1:30 and a long time since the fried egg this morning at six o’clock. She has fixed two china plates with a sandwich, cut corner to corner and a real cloth napkin beside each plate. I have a tall glass of water next to my sandwich. I am not sure what is between the two pieces of bread, but I spy a piece of tomato sticking out, so it can’t be all bad. She asks how the stairs are coming and announces she will take care of the rest of the boiling laundry. I tell her the corners are cleaned so she gives me a wire brush and has me refill the pail with hot, sudsy water to clean the stairs themselves. She says by that time it should be nearly four o’clock and I can leave. The stairs are done and Miss Hobbs compliments me on my work, which makes me feel good. I’ve never been a maid or a cleaning woman before. She says there is plenty of work to be done including polishing the silver and when her friends come to lunch, I can help prepare the pretty salads. Oh, Lord. I am walking home now and feeling a bit tired, but glad Miss Hobbs liked my work. I pass by the Colby Ring home, the Lee Sumner home and to the top of the hill. Now it is all downhill to Dan Cole’s farm. That is easier on the legs for sure and then just a mile down the tarred road to home. I can smell beans and hot dogs. 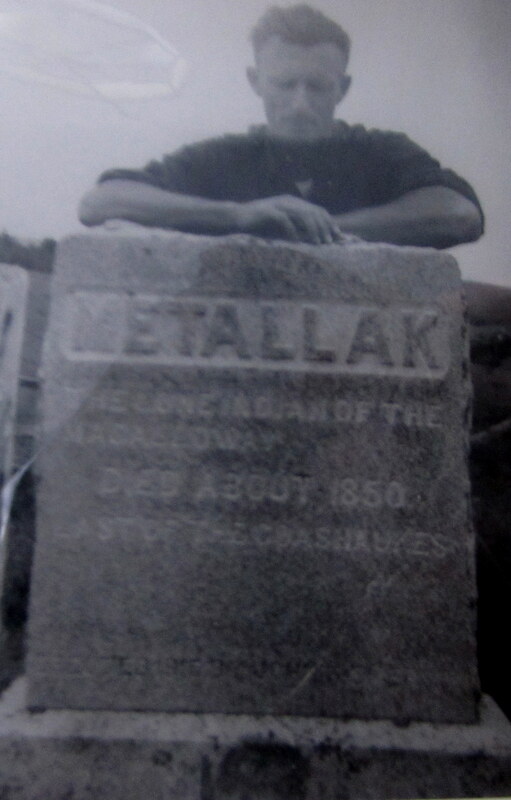 Dad doesn’t like hot dogs but he is still talking about visiting Metallak’s grave, so Ma probably figured he’d never notice what he is eating. I am almost too tired to eat. Waking time will come early and boy, I am ready to go to bed. Is this what they call the work force? It has been coming for some time. I dread it as I am not fond of pomp and circumstance and all that goes with it. Mr. Meserve, our “big room” teacher has stressed to us that we must all act like ladies and gentlemen, which I find not at all to my liking. For days we have practiced marching up and down the sidewalk in front of our Locke Mills Grammar School. John Chase is our class Marshall and he walks backwards leading us on our way, swinging a pole which hopefully will be replaced with something much more attractive. I believe it will be some sort of pole well covered with colored crepe paper with flying paper at each end. We are supposed to be stepping on the left foot when the baton goes down…or is that the right foot? Well, in the end, if all of us can step in unison, I guess it doesn’t matter. We were told the girls must have white dresses and white shoes. When I asked, my mother replied that NO I could not wear white sneakers, but she would buy some white sandals which would make me look like a lady for one night out of the year. I told her I did not want anything on my feet that had a hole in the toe and if they couldn’t put a whole shoe together without leaving gaps, I didn’t want a pair. She then informed me that she worked hard for her money and was going to make sure that I wore whatever she chose. I know Ma works hard, so after that I just sighed and heaved my whole body up the stairs into my side of the attic to think over the whole matter. I have only been to this school and I am not keen on leaving it, to tell the truth. I remember when we were really small and were taken on a “field trip”. We walked on the side of the road, with our teacher on the outside and someone’s mother there as well, to keep from getting hit by a car racing down Route 26. We walked all the way to Terrill’s store which was quite a distance , I can tell you. When we got there, though, we were each given a Dixie cup and when we pulled the cover off, there was a picture of a movie star. I wasn’t too impressed as I wanted to get to the ice cream with my wooden spoon. Mrs. McAllister had us all sit and eat our ice cream and probably to give our legs a rest before we headed back to the school. 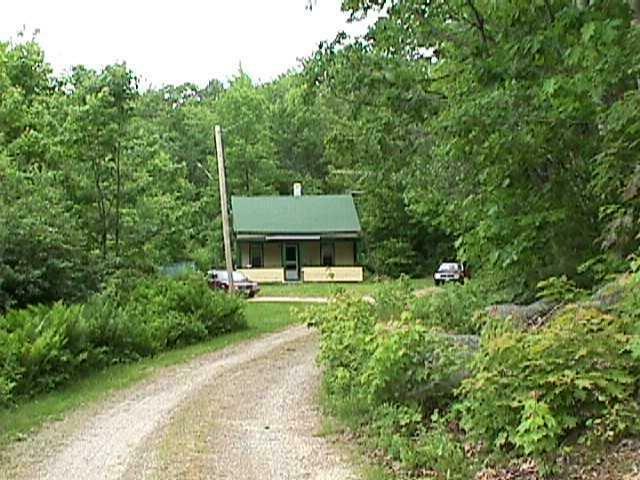 I remember how tired my legs felt as we got to the top of the hill where I could see the school house. That was quite a walk!! I must have forgotten how tired my legs were because I decided one day to march in the Memorial Day Parade. Ma said, are you sure. Well, of course, I was sure. I took my place in the parade, held on to that little American Flag and almost died on my feet before we finally got to the cemetery. I swear we walked a hundred miles. It takes me a long time to learn, apparently. But now I am older and the march is only a few feet, but it is to be in front of all the village in the Town Hall. We have the afternoon off from classes to decorate the Town Hall so that it will look pretty behind us as we sat in a half circle on stage. There aren’t too many of us and Kay is the only other girl. I am sure she will be wearing a white dress and white shoes as well. The day has come. We all go to the Hall with the boys laughing, shouting, running and just glad to be out of school. John is there with the real version of the baton and we march while the piano pounds out the graduation march. Mr. Meserve has found someone to replace him at school and he paces back and forth, finger in his watch pocket, watch chain or whatever it is called, swinging as he paces. “Left foot on the down beat, left foot on the down beat” he keeps repeating. If I roll my eyes one more time they’ll roll down the aisle in front of all of us. This was the teacher who seated me with the sixth graders for talking earlier in the year, so perhaps I should just grin and bear it. I would think John would get dizzy walking backwards and run into one of those chairs all sitting in a row, but he seems to be under control. Well, the night is here. I try not to think that our class will be divided; some will go to Gould Academy and some of us will go to Woodstock High School. Ma graduated in 1933, so it just stands to reason we will go to Woodstock. Fine with me. I don’t care where I go as long as there are some sports to play, but I don’t say that out loud. We line up in a row and I peek around to see who is in the Hall. Good Lord, it looks like the whole town has turned out for this graduation. There is no one from the lower part of Greenwood this year. 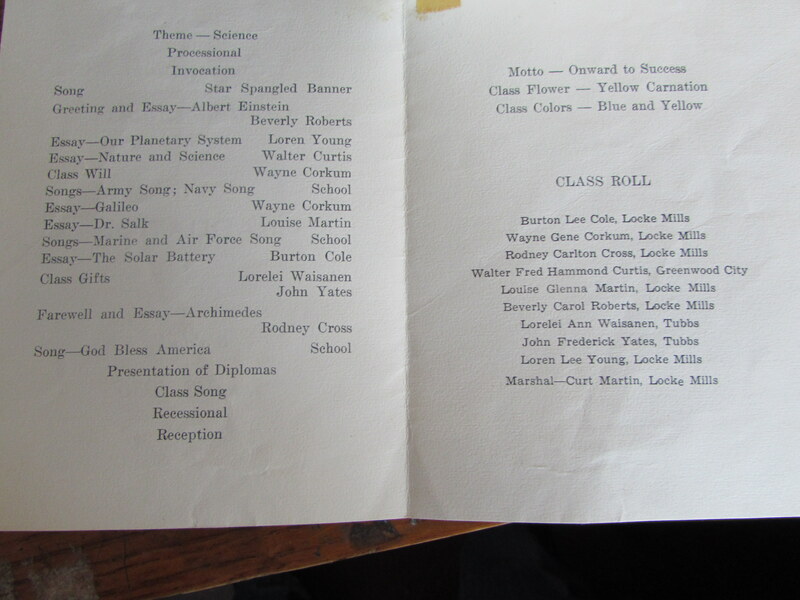 Some years there are students from Colista Morgan’s school and also the Tubbs District. I wonder how comfortable those hard wooden folding chairs must be. I will ask Gram tomorrow. I can see her on the aisle down near the front because I recognize her white hair up in a bun and a little hat perched on the side of her head. Ma is sitting with her. Dad doesn’t come to these things. I guess, by now, he is in bed reading a western paperback. I wish I were in my attic reading something..anything. The music starts. John looks nervous. Mr. Meserve raises his hand to let John know when to come down and he whispers again “Left on the down beat”..good grief, we know this. I am getting nervous because I do not like sitting forever on that stage with everyone looking at me. Rex looks cool the way he always handles things like this. Carl and Verne Corkum are brothers and they look as though they can handle this…well here we go. We sit. Each of us has a little part to get up and recite. Since we have rehearsed this so many times, it is like a bee buzzing in my ear. I get up, say my part as quickly as possible and get back in my chair, hoping I don’t fall on my face wearing these sandals. I am amazed I made it down the aisle without falling in someone’s lap. It is OVER! Hurray. The piano player starts and we all rise, turn at the same time and exit the stage. There is a sea of smiling faces as we exit the hall much the same way as we came in..with John walking backwards, swinging the baton. There is only one difference…most of us are heaving a sigh of relief! I am alone in the attic now, having taken off those dreaded uncomfortable sandals and the lovely white dress Ma bought. I am remembering all the fun I had at Locke Mills grammar school. The Valentine boxes, the Barter Days, the exchanging of names at Christmas and all the May baskets hung on me by my friends from the village. I have a feeling that my school days are going to change come fall and I am not sure if life will ever be the same again. 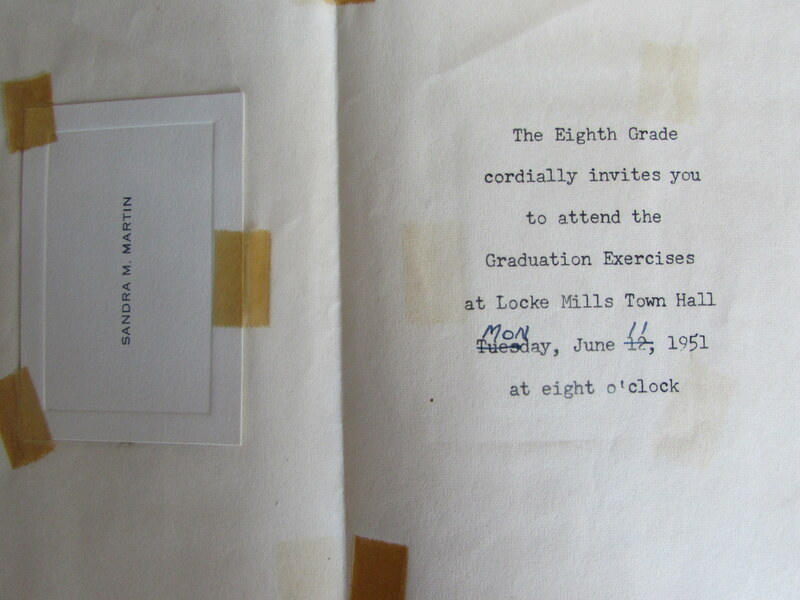 *I found the invitations pictured above in my Grammy Martin’s very old and almost crisp scrapbook. She saved all the graduation and play programs she attended. Today I am so excited. I have looked forward to this day for weeks. Every year the mill where Ma and Dad works has what they call a “Field Day” for all the workers. I always hope that Dad will decide to go because there are times when he says it is too far. The field day is held in Bear Pond Park in North Turner and yes, it is a long ride. When we got up this morning, Dad was sipping his coffee and glancing out the window. The sky is grey and there are a few drops of rain..a drizzle he calls it. I don’t think it is that much of a drizzle, but Curt and I wait and say nothing. Finally he says he doesn’t know if we should drive that far and find pouring rain or not. Ma tosses her apron on the back of the kitchen chair and says perhaps it isn’t raining in Turner. Well, I just hold my breath and wonder if we are going or not. Even if it rains, it won’t be raining in my favorite place at the park. It is so quiet I can hear the clock ticking on the wall. Finally Dad says, ok, let’s give it a try, but if it is raining, we are turning right around and coming home. Weeks ago, we were given a choice of having chicken or lobster for our meal and all of us always choose chicken. I have never had lobster and Ma says it would be too hard for Curt and me to get into and eat. Well, chicken I know and I know how to eat it! We pile into the back seat of the car and start down Route 26 and up over into North Paris. By this time, I am wishing the car could sprout wings and just get there. It is such a long way through Sumner , West Sumner and on and on. We’ll be there before long, Ma turns and says. She senses that we are getting tired and impatient but knows we won’t say a word as Dad wants it quiet when he is driving. The clouds are parting and the sun is peeking out. I poke Curt and we grin at each other just as Bear Pond Park comes in sight. There is my favorite place!! There is the roller rink!!! I cannot wait for it to open and the music to begin! I have the money to rent the skates and will try my darndest to not fall down or break a bone. Dad parks the car and he is off to find his friends. Ma gives us each a dollar and goes to hunt up Aunt Norma as they are going to perform a little skit of songs and jokes sometime during the day on a makeshift stage. She has a costume she has sewn so she will look like someone coming out of the mountains with a moonshine jug. Curt and I cross the road to the Ferris wheel. The roller rink hasn’t opened so we decide to ride. On we get and around and around we go looking way over the pond as it goes over the top. Oh, boy, now we have stopped at the top. We are waiting for someone to get on and I wish they would hurry! I do not like heights, but I feel so much happier than I did a few months ago, that I am not saying a word. I think Ma was glad we could come today because it wasn’t that long ago when I was very sad. 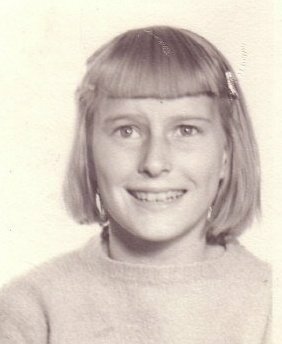 It came during a time when Ma was laid off, so she was home that Friday when I got off the school bus. I came into the kitchen and Ma was at the cupboard rolling out some biscuits. She brushed her hands together and the flour flew in the sunlight from the window. I put my lunch bag down and she said, I want you to sit down, San. Well, I thought, whatever for. I have chores to do and I don’t sit in the kitchen chairs, ever, except to eat. I want you to sit down, she repeated it again. I don’t know where Rex and Curt went. All I remember is how Ma wanted me to sit and I thought, now what have I done. Ma sat down next to me and said I have some bad news for you. What is she talking about, I thought. Has something happened to Dad? No. The boys would be here too. Your friend, Gladys Bailey, has died. I remember that her voice sounded as though it was coming from a barrel. What do you mean, Ma? She’s coming home this week end and I am going down to see her. I always go on week ends. No, San, you don’t understand. She was walking across the street in South Paris and was hit by a car. She died. She won’t be coming any more. The words kind of jumbled up in my brain and were swirling around . I wouldn’t be walking down and visiting Gladys any more week ends. Where did she go when she died? She wouldn’t be hiding a pen or a pin behind her back and making me guess what she had brought me for a surprise. How many years had I visited her every week end? I remember Ma saying are you all right, San? I just got up and walked out the house and went and sat on my favorite rock in the woods by the pond. I didn’t cry because Gladys would not have wanted me to cry. I watched the boats go by and after awhile I just went home. That week end I stayed by my bed in the attic and read, so I wouldn’t think about not visiting her. Now the days have passed and the hurt is not as bad. I am beginning to feel happy again and I am at one of my most favorite places in the world. Curt grabs my arm and says here we go again. Round and round we go until it is time for us to get off. Time for us to line up for our dinners and we all dig into the chicken. Suddenly from across the road, the door opens, the music begins and the roller rink is open. I grab Curt and we run across the road. Curt will watch while I try to skate around and around. He laughs when one leg goes one way and the other has a mind of its own and I grab the side of the rink. I love the music so I keep going until my whole body goes in one direction! 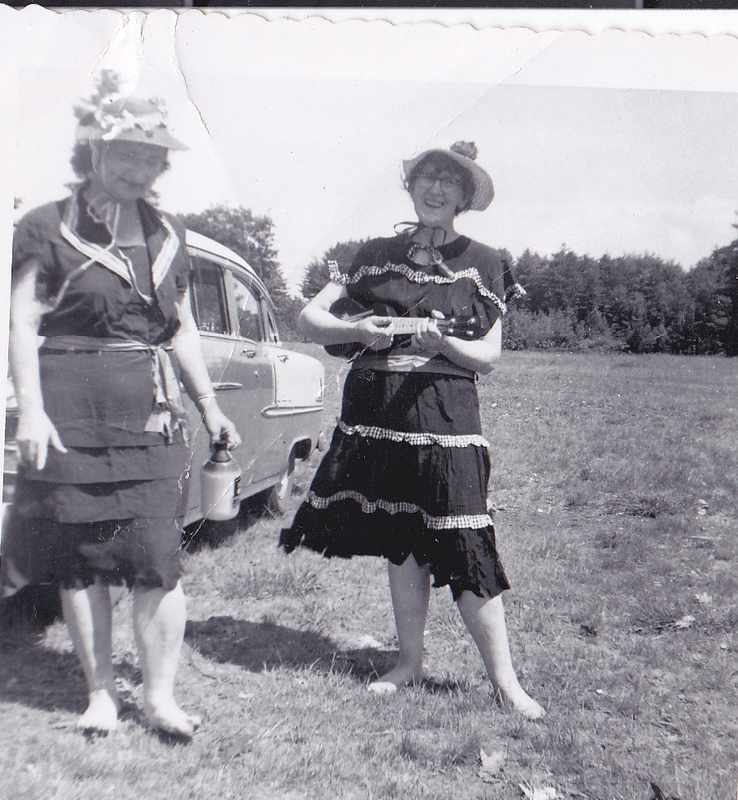 Ma and Aunt Norma have everyone in stitches doing their skit over in the field while others play softball. It is a good day. Gladys would be proud that I am smiling again. Well, it is hard to believe. I am so excited because at last..at last!…we actually have electricity!!!! The power company had to set the pole right up in our front yard, but enough out of the way, so Ma won’t hit it when she is backing up the car. She doesn’t drive too well in that direction and once scraped the side of the porch and asked me who moved the porch. I knew better than to even try answer her! The meter box is on the side of the house and Dad looks at it and watches it go round and seems pretty fascinated by it. His friend, an electrician has wired the house. Ma is proud that she has a bona fide electric clock on the wall with its cord running down to an outlet over the kitchen table and a round fluorescent light right in the middle of the ceiling. There’s a switch at the bottom of the stairs for a big light at the top so we can see our way better into the attic when we go to bed. Dad has a reading lamp by his bed now and he says it is sure better than the old kerosene lamp and it doesn’t stink either when he blows it out at night. Last week, Roland bought Ma a second hand refrigerator. Now this has to be the best thing ever for her! He told Dad that he still had to keep his beer cold in the brook and Ma gave him “the look” so that is just where Dad keeps it! It seems strange not to see the tall metal white cabinet where we always have kept our cereals and canned goods. Ma made provisions for them and she says having it is wonderful for keeping her meat cold! Another wonderful thing happened last week. I saw Harold, who married my Aunt Vi, outside in his garden and he said he had something he bet I would like to see. He said to come over a little before eight o’clock that night and to bring anyone who wanted to come. Rex, Curt and I went to Grammy Martin’s that night and went into her little parlor. There in the corner was a television set….I had only seen them in magazines!! I got so excited. We all sat and watched Dragnet in black and white and it was like having the movies right in your own house! I liked Joe Friday when he said, “Just the facts, Ma’am.” Harold just kept grinning all the time. I think we all wanted to stay forever to watch this wonderful invention, but we knew it wouldn’t be polite so we thanked them and went home. But since then, let me tell you, Grammy , Aunt Vi and I have discovered a great program. It is only fifteen minutes long but it is worth the hop and skip across the field. The man is named Liberace and he sits at a piano with his candelabra and he wears long tails, which he keeps flipping up when he has to move to start playing. Aunt Vi always giggles when he flips them! At the end, he looks right at us and sings, “I’ll be seeing you in all the old familiar places” ..well, let me tell you, Aunt Vi just giggles and giggles and Grammy says he is one fine piano player. Saturday night is the best night, Grammy told me. I think Harold and Aunt Vi went dancing and Ma and Dad were off so I went over. Grammy did some fiddling with the knobs and after the picture straightened out, what did I see but two men pushing and shoving each other around a ring. They weren’t boxing that is for sure. Gram says, you’ll like this, Sandra, they rassle all over the place. Well, we got so excited and started yelling for the one we liked the best. I didn’t know Grammy could yell so loud. She never yelled that loud even when the pig got out..but oh, my didn’t those men throw each other around. The next men to come up were, Grammy said, great big men and I might not like them. They were what is called Sumo wrestlers. Well I didn’t like them at all, but this was better than sitting at home doing nothing. Grammy yelled some more and finally one of them came out the winner and his hand was held high for the world to see. I told Grammy it was late and I had to go home. She told me to come back and watch the rassling any time with her. I know I will. I haven’t told Grammy and don’t think I will that I had a lot of bad dreams about those Sumo wrestlers. I don’t think I want to watch them any more, but the others I will yell as loud as she does. I haven’t told Ma and Dad about my going over to watch the wrestling with Grammy. I know they wouldn’t mind, but it is kind of my secret time with her and we have a good time. I asked Dad if he had thought about getting a television and he said money doesn’t grow on trees, but if he had extra, he wouldn’t mind having a little DuMont stuck in the corner. In fact, he said he would put his Morris chair right in there and probably watch some westerns. I think eventually Dad will give in and get one after he sees that Grammy has one in her parlor. Once you see a program, it is easy to want one. Ma says the dance crowd has really dropped off at Abner’s because everyone is staying home to watch a comedian named George Gobel. He has a round face and a crew cut and is supposed to be funny. She and Dad are wondering if this will be the end of the dance halls. I know that Ma sure is hoping that it isn’t. So now we are flipping the switch like everyone else. The Aladdin lamp is store with the other kerosene lamps for when the power goes out. You know, nothing is perfect and for sure, country folks don’t take anything for granted.